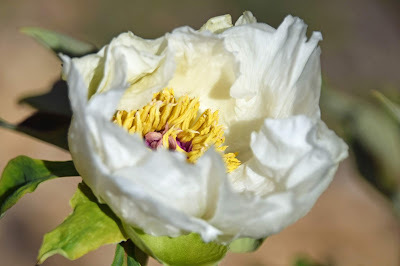 Southern Peony: 2019 First Peony Bloom of the Season! Anyway, Tree Peony 'White Phoenix' was the first peony to bloom in my garden this year, pretty much the same as last year. Tree Peony 'White Phoenix' and a dwarf red fernleaf hybrid both bloomed together on the first day of the season last year on April 2nd. So it looks like our peony season is starting just a couple days earlier this year. I don't think I saw any blooms open on the red fernleaf hybrid yet this year. Tree Peony 'Yao Huang' ('Yao's Yellow') bloomed the day after Tree Peony 'White Phoenix' last year. Tree Peony 'Yao Huang' looks like it is about to pop open. So let's see if it blooms 2nd again this year. Good luck with the new job! and congratulations that your bloom season has started. It does sound like you've got a lot going on indeed. Hoping you'll post pics of Yao's Yellow. It's one of my favorites! Thank you! I am very happy about both. I just hope I can accomplish everything I'd like to! I will surely post some pics of tree peony 'Yao's Yellow'. It did not fully open today, but I'm sure it will soon. 2019 Tree Peony 'Angel Emily' Snapped Off!